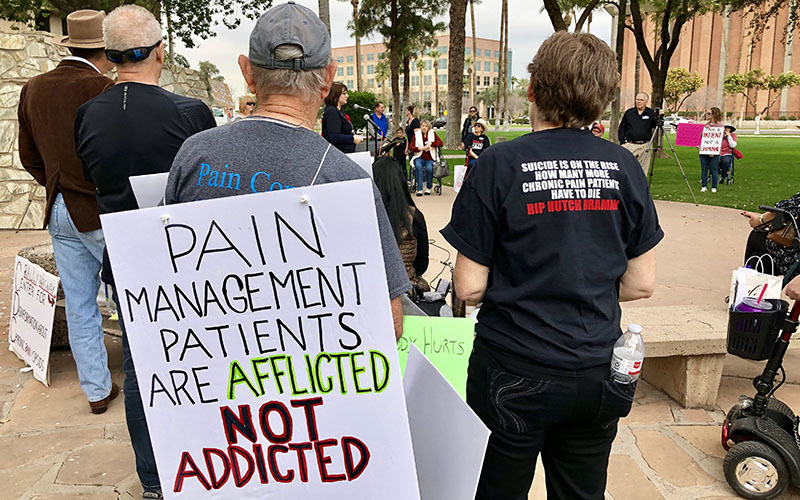 PHOENIX – Debra Hickey, who has lived with chronic pain for two decades, recently went to her medical specialist for her regular dose of 30 milligrams of oxycodone. The doctor told her she had to reduce the dosage because of state regulations to decrease the number and dosage in patients’ opioid prescriptions. Hickey, 63, of Phoenix, was appalled. And scared. Hickey, lamenting the restriction of an opioid that happened to be one of the few pain relievers she isn’t allergic to, joined about 40 people at the rally. Many smoked cigarettes, some pushed walkers or used wheelchairs and some carried signs, such as #PatientsNotAddicts and Afflicted Not Addicted. They characterized themselves as casualties in the battle against opioid addiction. According to the Centers for Disease Control and Prevention, opioids were involved in 47,600 deaths in 2017, and opioid overdose deaths were six times higher in 2017 than in 1999. About four out of 10 deaths involved a prescription opioid. In 2016, the CDC changed its guidelines in response to the epidemic, telling doctors to start patients on small dosages and increase the amount slowly or prescribe high doses of ibuprofen instead to manage pain. The Arizona Opioid Epidemic Act includes a so-called five-day rule, limiting the initial prescription fill to five days, along with a maximum dosage limit of 90 morphine milligram equivalents for patients seeking additional prescriptions after the first fill. 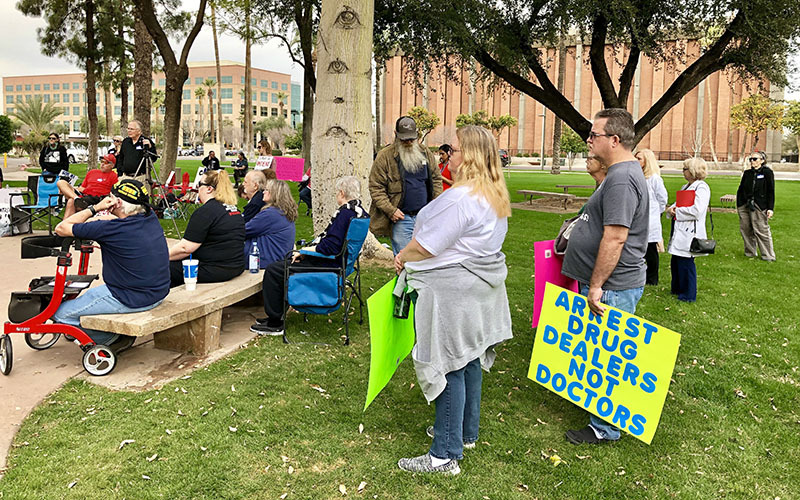 Officials with the Arizona Department of Health Services did not respond Tuesday to a request for comment on the rally. Hickey, who said the dosage decrease left her bedridden for weeks, said the nationwide rallies planned in 50 states were to gain the attention of lawmakers and make prescription opioids more accessible to those who desperately need them. Advocates did not outline a specific plan. Organizer JoAnn Nuara said the groups’ needs are unfamiliar to lawmakers and neither Ducey nor legislators have responded to letters outlining their issues. She said that before the opioid epidemic erupted, chronic pain sufferers were able to get the drugs they need to function and live somewhat normal lives. But regulations for prescribers have thwarted some patients’ ability to get medicine, leading many to use alternative street drugs, she said. Nuara wears a brace around her torso to help her to manage her autoimmune disease. 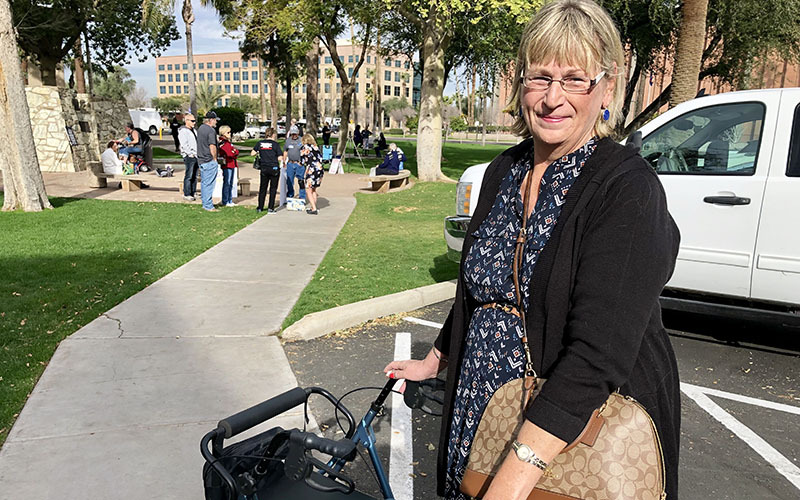 She also gets steroid injections and epidurals – treatments she never had to resort to before her doctor had his license revoked by the Arizona Medical Board 18 months ago because of allegations he had improperly prescribed Subsys, a cancer pain relief drug. The new Arizona restrictions have made picking up prescriptions a hassle, Nuara said. Pharmacies carry smaller supplies of opioids and she sometimes has to go to three or more pharmacies to find one that stocks opioids. She said more chronic pain sufferers are speaking out. Nearly four times as many people showed up at Tuesday’s rally compared with another in September, Nuara said.